Parsley is a herb that is very commonly used as decoration for fancy foods. Because of its reputation as a garnish, it is often forgotten as a herb with many surprising healing properties. Parsley contains health benefiting essential volatile oils such as myristicin, limonene, eugenol, and alpha-thujene. Adding fresh parsley to almost any dish gives food a bright, flavorful boost that the dried version of the herb just can’t provide. Parsley is packed with anti-inflammatory agents such as luteolin and vitamin C. These agents may help prevent certain types of arthritis. The anti-inflammatory agents' vitamin C and luteolin are also known as potent antioxidants that help fight disease. Antioxidants kill the free radicals that cause oxidative stress and disease. A Minnesota study shows that myristicin, a compound found in parsley fights oxidation and may slow the growth of tumors. Parsley is great for the heart. It is a good source of folate, which helps protect blood vessels from high levels of homocysteine. Adding parsley to your diet can help prevent cardiovascular disease, stroke, and other heart conditions. Vitamin A and C are potent antioxidants and are well known for their abilities to strengthen the immune system. In addition to vitamin C and A, parsley is also rich in vitamin K. In fact, it is extremely rich in vitamin K, providing 153% of the recommended daily value. Vitamin K is great for strong bones and a healthy nervous system and has been found to have an important role in bone health by promoting osteotrophic activity in the bones. It may help Alzheimer’s disease patients by limiting neuronal damage in the brain. Follow the easy steps for a fast, efficient way to prep parsley the next time you cook―and to store whatever you don’t use for maximum freshness. Dunk your parsley bunch in a bowl of cold water and swish it around; dirt will fall to the bottom of the bowl. For very sandy herbs, repeat with clean water until the bowl is clear. Remove parsley from the bowl and shake off excess water. Pat parsley dry with paper towels. Set damp paper towels aside to use in storing parsley. Grasping the base of the bunch, use a chef’s knife to shave leaves off stems at an angle, working away from your body. Only shave off as much parsley as you plan to use immediately. Remove thicker stems, gather leaves in a pile, and slice roughly. Don’t press the parsley leaves too hard; you may bruise them. For a finer chop, use one hand to hold the tip of the knife on the cutting board while the other hand rocks the knife down and across the leaves; continue until parsley reaches your desired consistency. 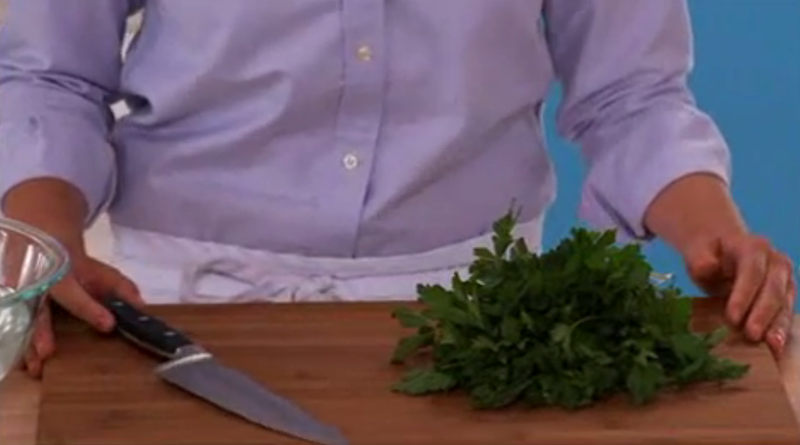 Tip: Use damp paper towels to wrap and uncut herbs and store in plastic bag; refrigerated, they’ll keep for 3 to 5 days. 1. “6 Health Benefits of Parsley.” 6 Health Benefits of Parsley. N.p., 26 Mar. 2011. Web. 14 June 2013. 2. “Myristicin: A Potential Cancer Chemopreventive Agent from Parsley Leaf Oil.” Journal of Agricultural and Food Chemistry. N.p., Jan. 1992. Web. 14 June 2013. 3. Power your diet: “Parsley nutrition facts“. Web. 14 June 2013.